Verona Walk Homes: Enjoy luxurious living with this breath taking Carlyle home. With southern exposure this home has many upgrades that include: remodeled kitchen, hardwood floor that is in the formal living room, dining room, and study area, tile in all other areas of the home, stainless steel appliances, crown molding throughout the home, custom surround sound system inside & out, all baths renovated, landscaping in front of house has been redone. Lanai has custom awning, built-in kitchen. The in ground pool has custom brick paver deck, fully screened and a custom waterfall. Verona Walk Homes: LOOK at this beautifully furnished South facing Carlyle 4 bedroom, 3 baths with 2 car garage home Divosta Built Sold. Relax in your own private pool while enjoying lake views. Crown Molding in main areas of home, carpet in bedrooms and tile in main areas, a decorative wall in guest room, plantation shutters on windows, tile backsplash in kitchen and decorative inlays on walls in dining room. VeronaWalk offers 24 hr guarded gated entry, lighted tennis, boccie ball, basketball and pickleball courts, resort-size community Lagoon pool, lap pool, children's play area, over 20 miles jogging/hiking trails, 24/7 fitness center. The Town Center features post office, café/restaurant, travel agency, hair salon, car wash, gas station, library, computer center, ballroom, card rooms, and a full-time activities director. VeronaWalk was awarded "Community of the year" for the State of Florida in 2014. Verona Walk Homes: Simply AMAZING! Coffered ceiling, open concept kitchen, custom entertainment cabinet in living room, exotic granite countertops, quartz on bathrooms. Countless upgrades done including brand new impact resistant windows, sliders, and doors! Gorgeous contemporary design, a must see! Open House this Saturday 4/13 1-4pm! Verona Walk Homes: Beautiful Carlyle pool home with 4BR,3.5 baths and a 2 car side load garage -2500 sq ft under air.This poured concrete home has been well maintained by its original owners and is loaded with upgrades including crown moldings and custom trim, enlarged paver driveway and walkway, screened front porch, heated pool with custom rock waterfall feature, stone look lanai floor, electric lanai shutter and awning, ceiling fans, family room wall unit, new AC, washer/dryer and more. Glass front door leads to living room with wood floors, fireplace and french doors to your formal dining room. Windows have plantation shutters or custom shades, floors are tile in living areas and MBR and carpet in guest BRs.Kitchen opens to family room and has granite counters, marble and granite backsplash, stainless appliances and pullout drawers/shelves. Verona Walk has 24/7 guarded gate, walking/bike trails, tennis, bocce, pickle ball, fitness center, lap & resort pools, restaurant, post office, car wash, gas station , clubhouse and Activities Dir. Residents enjoy an "active lifestyle" and low HOA fees which include lawn care, cable, security monitoring and manned gate. MSTA-YOU WON'T BE DISAPPOINTED!! Verona Walk Homes: Elegant RARE EXTENDED Caryle with Southern Exposure, Crown Molding, Tile, Plantation Shutters Throughout, Fireplaced Living room with French Doors overlooking front porch, extended driveway with pavers, Heated pool with screened lanai overlooking water. Gated, community pool, lap pool, bocce courts, pickle ball, tennis courts, basketball, fitness center, restaurant, travel agency, hair salon, post office Real Estate Office, Gas station, Car wash.
Verona Walk Homes: JUST REDUCED !!!!!!!!!! METICULOUSLY MAINTAINED CARLYLE LOCATED IN CUL-DE-SAC. 4 BEDROOM, 3 1/2 BATHROOMS, CARPET AND TILE, ENTERTAINMENT CENTER, CROWN MOLDING, A MUST SEE HOME. HEATED POOL AND SPA WITH LARGE LANAI OVERLOOKING INCREDIBLE VIEWS. GATED COMMUNITY, COMMUNITY POOL, LAP POOL, RESTAURANT, POST OFFICE, HAIR SALON, TRAVEL AGENCY, GAS STATION, CAR WASH, BOCCE, PICKLE BALL, TENNIS COURTS, BASKETBALL. Verona Walk Homes: Over $90,000 in Upgrades and Furnishings! Must See, TURNKEY FURNISHED and easy to Show. Live the Florida Dream and step into your tropical oasis! Veronawalk features a resort lifestyle second to none. This home has a unique CUSTOM POOL & SPA and is a DIVOSTA BUILT SOLID Oakmont constructed with poured solid concrete. There is no home like this one. It's perfect to move right in or rent out as investment. Tiled floors throughout in extended areas, spacious living room, high 12-foot ceilings and an open kitchen and dining room overlooks your custom pool, spa, and large lake view. Home is situated towards end of cul-de-sac. The tiled den is easily convertible into a 4th BR, office or playroom. A large screened in southern facing CUSTOM pool & spa keeps sun for your enjoyment year round. Wake pool side overlooking your serene lake view. Verona Walk is an award-winning community with amenities including resort pool, gym, bocce, pickle ball, basketball court, har-tru tennis courts, playground, gazebos, walking and biking paths, ballrooms, library, restaurant, salon, bank, gas station and office with management including activities director. This community truly has it all! Welcome home! Verona Walk Homes: The moment you step through the stunning upgraded glass door you will notice this light and bright home has been meticulously maintained. Enjoy the amazing long lake views from your Custom Pool/Spa with sun shelf and expanded Lanai. This (Tifton Walk Model) has 3 bedrooms (in the process of converting Den to 3rd bedroom) Sunroom/Den, Crown Molding, Granite, upgraded Stainless Steel appliances, 3 car tandem garage. This amazing community has it all, 24/7 guarded gated entry, lighted tennis courts, bacce ball, basketball. The town center offers, Post Office, Restaurant, Travel Agency, Hair Salon, Car Wash, Gas Station, Library, Computer Center, Ballroom, Card Rooms and a full time activities Director. This is a home for the most discriminating buyer. Verona Walk Homes: Caryle model on OVERSIZED LOT and pool! SOLID BUILT HOME! Move in condition! This well maintained Carlyle pool home overlooks a serene lake. New AC in June 2018, new pool equipment in August 2018! This home is located on an oversized, premium, cul-de-sac lot. You'll instantly feel at home and know "this is the one" when you enter this home. This home is in excellent condition and offers features such as plantation shutters throughout, bright/neutral paint tones, beautiful sunset views over the lake, and easy walking distance to the Town Center. This alluring home was built using the DiVosta/Pulte poured concrete system which saves on homeowners insurance. 4 bedrooms, 3+ bathrooms, new stainless appliances, updated fans, a home office, attached 2 car garage with epoxy finish, and more! Low quarterly dues include lawn maintenance, basic cable, guard gate, clubhouse with restaurant, fitness center, two community pools, tennis courts, post office, gas station, car wash, and jogging path. Verona Walk truly offers a Resort lifestyle only minutes from the Gulf beaches , Marco Island and downtown Naples. If you're looking for a place that says "welcome home" then this one is a MUST SEE! Verona Walk Homes: AN UNBELIEVABLE PRICE FOR THIS QUALITY HOME! Meticulous clean Carlyle 4 bedroom, 3 bathroom, located on a desirable street in VeronaWalk. Home offers stainless steel appliances, double crown molding, tile, wood floors, Heated Pool and Screened lanai overlooking beautiful waterways. House is an easy walk to the VW Town Center with all the amenities! Gated community with community pool, lap pool, fitness center, restaurant, post office, gas station, hair salon, travel agency, car wash, bocce, tennis courts, pickle ball, activities director. Verona Walk Homes: BEST LOT IN VERONAWALK !!! BIG LAKE AND BIG VIEW ! RARE OPPORTUNITY , OAKMONT MODEL , ORIGINAL BUILT SOLID POURED CONCRETE. Looking for a smart buyer that wants a perfect house to upgrade, this house has all features that are not offered with new homes, huge lake view, 12ft ceilings , smooth coat walls , privacy wall on back of lanai,central vac , finished closets,cable and telephone jacks galore in every room, extended Italian Porcelain tile, wall unit ,brand new AC system installed June 2018, also pool heater is 1 year old. this home has 3 bedrooms plus den , master bedroom has his and her sides . VeronaWalk offers 24/7 guarded gated entry, lighted tennis, boccie ball, basketball and pickle ball courts, resort-size community pool, lap pool, children's play area with equipment, over 20 miles jogging/hiking trails, and 24/7 fitness center. The Town Center features post office, restaurant, travel agency, hair salon, car wash, gas station, library, computer center, ballroom, card rooms, and a full-time activities director. VeronaWalk was awarded "Community of the year" for the State of Florida in 2014. Verona Walk Homes: Real Divosta "Built Solid" Poured concrete Southern Exposure Extended Custom Oakmont, This home has too many upgrades to list, a must see, Special Features that are included with home are: Rare Long Lake View with Southern Exposure, upgraded storm protection with Accordion hurricane shutters everywhere, extended model 2200 sqft. , upgraded awning on Lanaii, extended porcelain tile throughout. Don't forget all of the original Divosta Features that you can not buy any longer, 12 ft ceilings in the great room, 6ft Privacy wall on the lanai, smooth coat walls, finished closets, central vac, cable jacks galore. Custom Barn doors on all sliders, Stainless Steel appliances, new pool pump, and heater installed 2018. VeronaWalk offers 24 hr guarded gated entry, lighted tennis, boccie ball, basketball and pickleball courts, resort-size community Lagoon pool, lap pool, children's tot lot, over 20 miles jogging/hiking trails, 24/7 fitness center. The Town Center features post office, restaurant, hair salon, car wash, gas station, library, computer center, ballroom, card rooms, and a full-time activities director. VeronaWalk was awarded "Community of the year" for the State of Florida in 2014. Verona Walk Homes: JUST REDUCED DON'T MISS OUT!!! !Meticulously clean with many many upgrades in this Tifton. Bamboo hardwood floors throughout, hurricane shutters, Granite counters and Custom kitchen with Custom bar area, Premium Sound System throughout,2 bedroom with den and flex room, 3 piece crown molding, Master Bedroom Closet has premium His & Hers closet organizers,Garage has 4 feet extension, stucco painted walls, Epoxy Garage Floors, overhead Storage Rack, Ceiling Fan in garage, Premium sound system ceiling speakers with wall volume control, Heated pool, pavers Custom screened lanai with incredible Full length water views on both sides,13x10 Sunbrella Fabric Motorized Retractable awning with remote control,Landscape tree lighting in front and rear of home, Premium sound systems in lanai,Custom Built Outdoor Kitchen 32" commercial grill with 2 propane storage tanks, Commercial hood vent, draws, side burners, flip up counter, custom stone outside front, Granite counter tops with step up bar, wine beverage cooler, Over $90,000.00 in upgrades. Gated community, community pool, lap pool, fitness center, restaurant, hair salon, travel agency, real estate office, post office, gas station, car wash.
Verona Walk Homes: One of the nicest Oakmont homes in all of Verona Walk. This house originally had over $100,000 in upgrades. Since that time several updates have been made including a renovation of the master bath shower, new stainless appliances, the A/C is 4 years old, lots of custom wood trim has been added and it will soon have a brand new tile roof! (the roof is $63,000, scheduled for install and is included in offering price). This home was built prior to Pulte Homes switching to block construction. It is solid poured concrete with steel reinforcement, a fortress to call your own!!! The Oakmont offers an open living area with high ceilings, spacious rooms and lots of light. Check this one out and compare. The value added by the new roof alone is reason to act now! Verona Walk Homes: Perfect Home !!!! This home has it all !!! Oakmont "Built Solid " poured concrete with electric hurricane shutters on every window and slider. This is an original built Divosta Home with all of the features you can not purchase anymore. The Location is spectacular End of the Cul-de-sac with a bridge view, facing west . Standard features include 12 Ft. Ceilings , 6ft. privacy wall on the Lanai, smooth coat walls, central vac, finished closets, Divosta wall unit, Extended Italian porcelain Tile. Custom Features are crown molding , custom bench wall unit in Den , custom Drapery, upgraded fans through out . VeronaWalk offers 24 hr guarded gated entry, lighted tennis, boccie ball, basketball and pickle ball courts, resort-size community Lagoon pool, lap pool, children's play area , over 20 miles jogging/hiking trails, 24/7 fitness center. The Town Center features post office, restaurant, travel agency, hair salon, car wash, gas station, library, computer center, ballroom, card rooms, and a full-time activities director. VeronaWalk was awarded "Community of the year" for the State of Florida in 2014. Verona Walk Homes: Gorgeous Pool Home in highly desired Verona Walk! This very bright 4 bed/2 bath home with den, all with upgraded features, has a perfect set up for entertaining. A beautiful kitchen with expansive island is open to the dining area, very roomy living area, and the extended den that leads to the outdoor covered patio with an oversized lanai and extra-large pool. The luxurious window coverings accent the high ceilings with crown molding, all granite countertops, stainless steel appliances in the kitchen, tile throughout the entire home. This home is a must see! Welcome to resort living! 24-hr guarded gate, over 20 miles of walking trails and bike paths around the lakes and beautifully landscaped scenery. The Verona Walk Town Center has a Post Office, restaurant, beauty salon, gas station, car wash, community pool, lap pool, lighted tennis courts, pickle ball courts, bocce ball, fitness center, library, and children's play area. This community was awarded "Community of the Year" and is also rated Blue Zone. Furniture is negotiable. Verona Walk Homes: Unbelievable Price Reduction on a Custom Home !!!!!!! Divosta poured concrete Oakmont, New Lead glass Entry Door, Den offers built in desk, free standing closet/storage unit, Murphy bed, UV film on windows, Bedrooms 2 & 3 New Carpet, New Fan/Light Kit, Master Bedroom New Carpet, Master Bath New Walk in Shower, Tile Wall, Living room New fan/light, Upgraded Sliding Doors by Sliderman for smooth opening and closing, Custom Drapes/Sheers, Custom Wooden Valances above Sliding Doors, Custom Painted Entertainment Center with Custom Doors, Kitchen Quartzite Counters, New Backsplash, newer appliances,Custom Drawers and Doors, In 2016 New A/C,Hot Water Heater,Electric pool Heater, 2018 New Pool Pump, Pool Filter, Solar Panels to Heat Pool, Crown Molding Throughout, Electric Rear Shutters and Accordians on the rest of home, Extended driveway pavers, Pavers Extended around house and Screened cage around Pool. Verona Walk Homes: Impeccably maintained Oakmont with Southern exposure, Stainless steel appliances, Granite, tile, carpet, wall unit, security system, heated pool with screened lanai. Gated, community pool, lap pool, bocce courts, tennis courts, picked ball, basketball, Restaurant, hair salon, travel agency, post office, Real Estate office, gas station, car wash.
Verona Walk Homes: Come and see this light and bright Oakmont model situated on a corner lot with an exceptional lake view and water on two sides. This residence is ideally set with western exposure, allowing sun on the pool from morning till sunset. This beautiful 3 bedroom plus den, 2.5 bath home features the popular wall unit in the large great room, tile throughout the living area, new granite countertops in the kitchen, new carpet in the master bedroom, built-ins in the master bedroom closets and more. You will love the kidney-shaped pool on the extended lanai providing a panoramic view of the Venetian style bridges Verona Walk is famous for. All ready for you to move in and enjoy today! Conveniently located just a few streets away from the Town Center that features a 20,000 square foot activity hub with Fitness Center, 8 Har-Tru Tennis Courts, resort pool, lap pool, bocce, pickleball, basketball courts multipurpose rooms with dance floor and theatre screen, cafe with lounge, bank, post office, gas station, car wash, hair salon and much, much, more. Come home to Verona Walk with its resort-style amenities and over 20 miles of walking paths all just a short drive to the Gulf. You will love it. Verona Walk Homes: You are sure to be impressed with this spotless, like new and perfectly kept Oakmont model featuring 3 bedrooms, 2 1/2 baths plus den! The generous foyer leads you to a spacious great room with custom built-ins, an open kitchen with granite counter tops, s.s. appliances and breakfast nook. The spacious master bedroom offers an en suite separate his and her baths. Your guests will enjoy their choice of comfortable bedrooms. The home is complete with a beautiful custom heated pool and spa with wonderful water views and ideal southwest exposure! Verona Walk is a 24/7 guarded gated community offering outstanding amenities and activities including a resort-style community pool, lap pool, fitness center open 24/7, tennis, pickleball and basketball courts, bocce, children's play ground, walking/running trails and a full time activities director. The Town Center is located in the heart of the community with its own gas station, car wash, post office, restaurant, hair salon, travel agency, library, computer center, card/meeting rooms and ballroom. 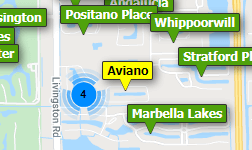 Just minutes to shopping, dining downtown and Naples and Marco Island beaches! The sellers will entertain offers including the furniture. Verona Walk Homes: NEW Reduced Price, Owners are ready to SELL! Check out this beautiful Oakmont Home on the BEST LOT in Veronawalk at end of culdesac w/ Wide Water Views! This rarely available Pool Home was only gently used seasonally and in pristine condition. Enjoy your heated pool & large private lanai w/ Western Exposure for maximum sun & gorgeous sunset views on the BIG LAKE. Loads of closet space, split bedroom layout, & great open floorplan w/crown molding throughout. Home features brick paved driveway w/large 2 car garage, bright & sunny den, & 2 beautifully decorated guest bedrooms. King sized master BR has slider doors out to lanai, huge walk in closet, & large his & hers separate master baths w/soak tub. Poured Concrete Divosta Built Home. Veronawalk is an active lifestyle neighborhood voted best community of the year & features resort-sized pool, lap pool, lighted tennis courts, bocce & basketball courts, play area, 20 miles of jogging/bike trails, & 24/7 Guarded Entry. Town Center includes post office, restaurant, bank, travel agency, gas station, car wash, community center, full time activities director, and a 24/7 Fitness Center. Short drive to beaches and downtown Naples. Need professional assistance selling your property at Verona Walk Naples? Find out how an Area Specialist can help to generate more property exposure in order to get the most money for your investment in the least amount of time.